I love to enter contests, in particular beading contests. 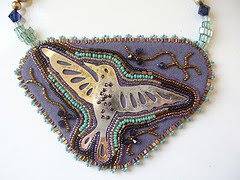 This piece was my entry into the Australian Beaders Bushranger's Bounty contest. 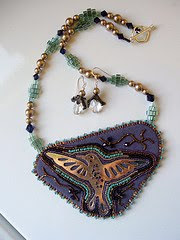 The kit supplied the bird, some of the seed beads, the green cubes and the crystals. I supplied everything else. The idea came to me from laying all the pieces out and thinking about it for a few days. I hope you like it, too.